With about two weeks to go before the suspense is over, the Nexus 5 breaks cover yet again with the best shot we've seen so far. 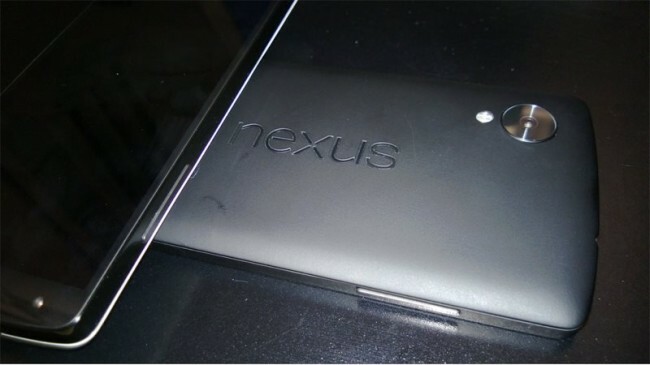 Matching the other pics we've seen so far, the Nexus 5 is rumored to be a variation on LG's current flagship the LG G2. Rumored specs include; 5-inch Full HD display at 442 ppi, a 2.3GHz Qualcomm Snadragon 800, 2GB of RAM, 16GB of internal storage (with the possibility of other capacities), 8MP, 2300mAh battery + wireless charging as well as LTE and NFC. We eagerly await the unveiling of the Nexus 5 as well as Android 4.4 and perhaps a new Nexus 10 (2013).